Yesterday we spent a pleasant seven hours visiting with our friends the Smiths in Wimberley, a town in the Texas Hill Country about 45 miles southwest of our home in Austin. 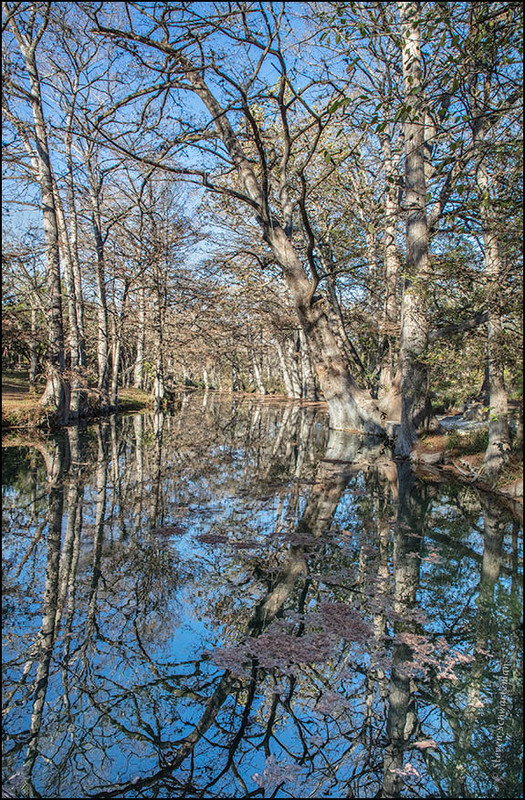 The picture shows a part of Cypress Creek called Blue Hole. The large trees are bald cypresses, Taxodium distichum. Thanks to our Hill Country creeks. And speaking of thanks, a happy pre-Thanksgiving to you. You spent seven hours and got this gorgeous souvenir. I drove seven hours one way and came away with a good bit of blah. So it goes. This is a gorgeous photo. The great advantage of fewer leaves is more sky — and wonderful reflections. As you pointed out the other day, it’s been a poor fall for colors this year, with even the bald cypresses not cooperating much. I’m sorry but not surprised that you didn’t get more for your seven hours of driving each way. I ended up with at least four good pictures of Blue Hole, all of them playing up the reflections. In the summer this is a popular swimming hole. Yesterday, by comparison, the place was indeed serene. Stunning photo and what an amazing reflection! All of the successful photographs I came away with emphasized the reflections, including that of the sky, which carried the weight of color for the image. Thanks. At first I wasn’t sure I could get a good picture. In the end I did. Thanks. I’ll reflect on what you’ve said. One of my first dorm friends at Texas A&M University in 1973 was from Wimberley. I spent many a day at his house, dare I say drinking beer inhaling second-hand smoke from joints. I never got into the whole marijuana thing that was all the rage in the ’70s. I was going to ask if you ever made it to Blue Hole on one of your visits to that friend. Then it occurred to me that Blue Hole might not have been open to the public back in 1973. Now it’s a municipal park. As for “the whole marijuana thing,” I hope you find you’re better off for not having gotten into it. Bald cypress just sound like magical trees to me. It is nice to see them thriving along this creek~how glorious they look. Fewer leaves does work really well, here. It was pretty muted around here as well. I did see a patch of sugar maples that turned a glowing yellow. The light under them was wonderful. Another inspiration for a painting? I’ve thought about that but I’m not sure it would translate to a canvas. I am inspired by a scene at the edge of a woodland on a quiet day recently. Layers of texture with very soft colors. Hopefully I’ll have the new studio space painted and set up soon. Lately the only things I’ve been painting are walls! I imagine that’s not the kind of painting you’d like to be doing. Happy new studio. Thank you 🙂 You’re right, and I’ve decided to hire someone for the ceilings and trim. Sounds to me like a practical decision.